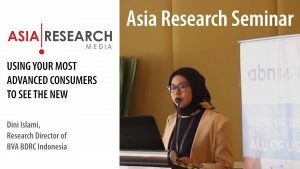 Asia Research has recently completed our 2017 research-on-research study in Asia, including the 6th annual Stakeholder Survey among those employed in the market research industry across the region (either as buyers or suppliers), and the annual Buyer Surveys in Singapore and Indonesia, specifically among corporations who engage external market research agencies. Our lead article for this edition of Asia Research reports on the key findings from these surveys. Based on the Stakeholder Survey, the primary source of market research business still comes from multi-national corporations (MNCs). About half (52%) of agencies in Asia state that this is their primary source of business, and another 25% state that this is their second or third largest source of business. But notably, those claiming MNCs as their primary source of business have fallen over the years, down from 68% in 2015 to 52% today. As a result, agencies have needed to look to other sources of business, and there has been a corresponding growth in business from Large Local Corporations (up from 9% as the leading source in 2015 to 16% today), and from the Public Sector (6% to 11% over the same period). Correspondingly, agencies report that MNCs scaling back their spend on market research against the backdrop of “general economic uncertainty” is one of the main threats to the market research industry. Based on the results from the Buyer Surveys in Singapore and Indonesia, both of these markets are under pressure. Since 2013, the Singapore market has been fairly static, with about half of clients reporting “no change” in their research budgets from the previous year. There was slight growth in net budget (i.e. those reporting an increase over those reporting a decrease) in 2014 and 2015, but there has been a decline in budgets since, and in 2017 the industry appears to be in recession, with a net fall of 10% of clients reporting a budget decline. Indonesia has seen far more change over the same period. In 2013 growth was buoyant, with a net 59% of clients reporting an increase in budget over the previous year, reflecting similar rates of growth seen in previous years. 2014 and 2015 was something of a ‘cooling-off period’ for Indonesia – still fairly good growth in budgets, but not reported by as many clients. But the last two years have seen the Indonesia market stagnate, with most reporting no change in budget from the previous year. As a consequence of the cooling of the market, we have seen fewer projects commissioned this year compared to previous years, and fewer suppliers used. In both Singapore and Indonesia, an average of 4 research suppliers were used by clients over the last few years, but this has fallen to 3.5 in Singapore and 3.7 in Indonesia this year. In Singapore and Indonesia, clients usually use both the large multi-national research firms and independent ‘mainstream’ agencies. Management consultants are also used for market research in both markets by about 20–30% of clients. 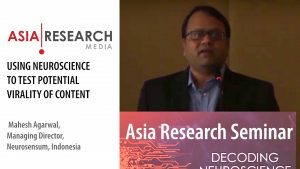 DIY research is found with 40% of clients in Singapore, but less so in Indonesia at 20%, reflecting the relative levels of in-sourcing of research in each market. But Singapore is different from Indonesia in terms of the range of research suppliers used, partly because of the availability of a wider range of suppliers in the market. 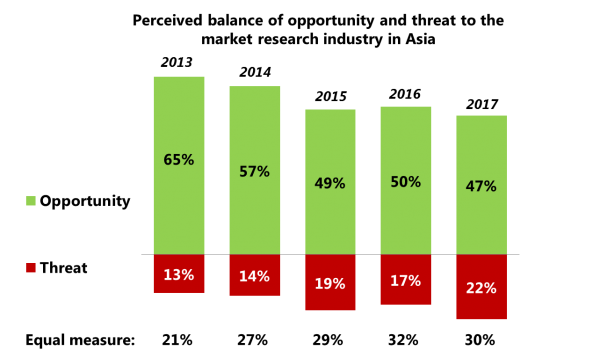 Far more clients in Singapore go straight to online panel companies for their surveys (with analysis conducted in-house) – 40% of clients ‘go direct’ vs only 5% in Indonesia. There is also more use of freelance consultants in Singapore – 18% vs just 3% in Indonesia. Community Panels or ‘Insight Communities’ are used by 15% of clients in Singapore, but only 2% of clients in Indonesia. Notably, there has been no growth in the adoption of these ‘communities’ in either market in the last three years, the reasons for which were discussed during the recent Asia Research seminar in Jakarta. 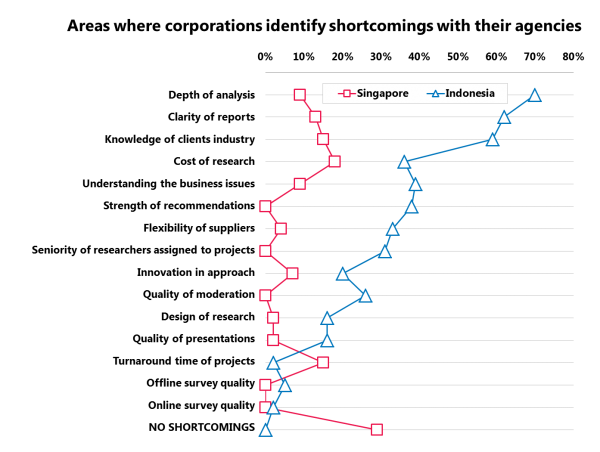 Another major contrast between the Singapore and Indonesia markets is the level of satisfaction of clients with their research suppliers. In response to the question in the Asia Research Buyer Survey “Where do you see shortcomings with your current market research suppliers, if any?”, 29% of clients in Singapore stated “no shortcomings”, whereas all clients in Indonesia could identify shortcomings with their suppliers, and in many more areas. The main complaints in Indonesia are lack of in-depth analysis, lack of clarity in the reports, and the agency not knowing the client’s industry, resulting in weak recommendations. Most of these areas are satisfied in Singapore, but clients in Singapore tend to be more concerned about the costs of doing research and the turnaround time of projects, partly because there can be more international studies commissioned from Singapore, which are expensive and time-consuming. 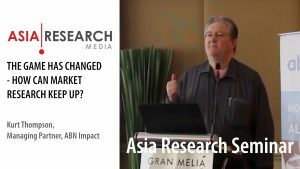 With reference to the Stakeholder Survey that represented both clients and agencies across the Asia Pacific region, the research industry recognises that it is in a considerable state of change. 45% of the surveys state that they expect to see “big changes” in organisations in the next five years, including 11% believing that “the type of research departments and suppliers we see today will no longer exist”. Despite the rapid changes in the industry and the pressures brought about by static budgets and increased competition, the industry remains mostly optimistic about the future – 47% of industry stakeholders state that they see more opportunities than threats, vs 22% seeing more threats than opportunities (the balance stating an equal measure). However, this is a far more balanced outlook than in 2013, when 65% reported more opportunities vs just 13% reporting more threats. 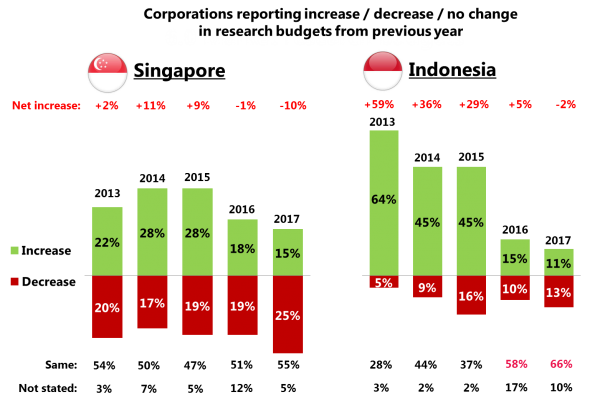 Consistent with previous years, the main opportunity for the research industry is ‘leveraging on technology’ – e.g. mobile and online – including new research methods through social media, big data, eye tracking, etc. But stakeholders also recognise that beyond just being clever with data and data collection methods, there are still opportunities in the ‘human element’, e.g. providing value added through greater insight and enhancing the reporting of consumer insight. What is notable is that the opportunities from organic growth and ‘growing consumerism’ in emerging markets can no longer be relied on, as shown by the stagnation in budgets in both advanced and emerging markets. The main threats are the ‘usual suspects’: price pressure from open tenders, in-sourcing of research, and, as mentioned earlier, the ‘big buyers’ of research in the MNC insight departments cutting back. In conclusion, market research/consumer insight will retain its level of importance within corporations, who will continue to spend in these areas. Suppliers will be squeezed on price and margin, meaning they will need to become increasingly efficient within their own operations, e.g. in terms of automation and efficient project management. But at the same time, agencies will need to add value through proper analysis of the data and consumer insights, and apply these through strong recommendations based on a better understanding of the clients’ business. The rate of change in the industry is increasing; much of this change is driven by the need of suppliers to innovate in order to demonstrate points of differentiation within crowded markets.